How do you feel about cloning; specifically gay republicans? Mel not sure why Mel opinion sought on such complicated issue, but Mel try anyway. Mel not very clear on concept of cloning. Also, Mel not real clear on gay. Or Republican. Or biggest mystery of all: gay Republican. Mel know only that cloning mean more people. And more people mean that more people might pet Mel on Mel's head, and that cannot be all bad. Do gay Republican pet doggies? mel genuinely hope so. 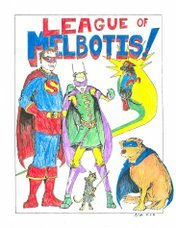 So mel highly in favor of cloning gay Republican if they have treat or take Mel to park so Mel can run and bark and they can pick up Mel-poo. Mel fairly certain if world full of gay Republican, world would be better place.